Taking design cues right from their own Optane SSDs, sharp lines and fairly minimal styling is in use. From what we can tell, Intel might be avoiding the obnoxious RGB flair present on some gaming oriented cards. Can't wait to build an all Intel system in 2021 with Ocean Cove and their 2nd gen GPUs. Last edited by WannaBeOCer; 03-23-2019 at 02:35 PM. Looks to me like a relatively low TDP GPU. Looks pretty slick. Reminds me of the way the processor in Terminator 2 looked. They also have a larger card, I just uploaded the photos. Unless that squirrel fan spins at 10K RPM or there's some sort of revolutionary cooling solution under that shroud I agree. But what's the point in introducing ANOTHER mid-range video card into the market? 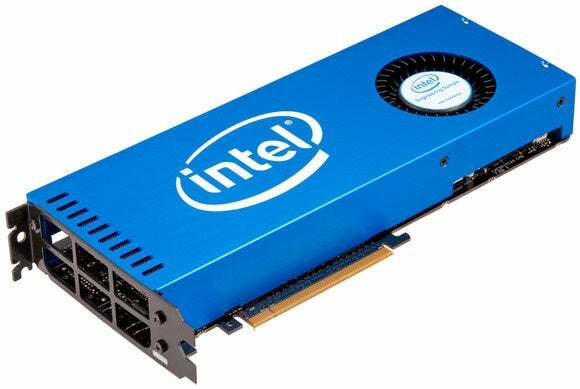 Are there people out here stupid enough to buy a video card just because it's Intel? Not bad looking... But I was hoping they would put an OLED skull on the back plate. No RGB no sale. Well hopefully if they add the blue lighting. You can turn it off. Location: That gap between the couch cushion. I thought that thing looked more like a chocolate bar. i prefer the looks of their Xeon Phi accelerator cards, then change the color scheme to skulltrail's. trolling an adult is very dangerous, don't try it at home nor at work. you don't want to play tag with a rabid man.